X-23 fought the Symbiote Warriors, which were created by the demon Blackheart from clones of X-23 bonded to different symbiotes. This led to a multidimensional battle involving the Spirit of Vengeance in an infernal version of Las Vegas. 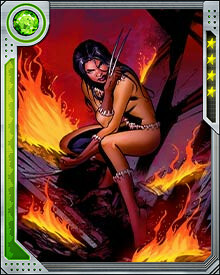 During this battle, X-23 was killed and then fought her way back out of Hell along with Red Hulk, Venom, and Ghost Rider.